I’ve been reading a lot recently about a touching story that has caught the imagination of the world. 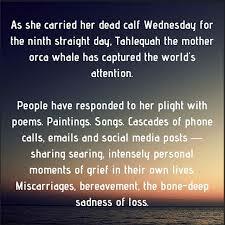 It’s the very human and relatable story of a mother Orca whale, named Tahlequah, whose calf died shortly after birth. Tahlequah has been mourning her baby by carrying it around with her for over 17 days now. 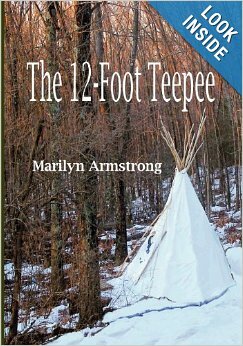 Her family, or pod, have been traveling with her in a funeral procession covering over a thousand miles. The length of this mourning period is unprecedented for the species. People have realized that the Orca’s behavior shows real emotional pain, similar to what humans feel. 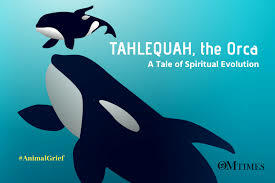 The attention the world has focused on Tahlequah has also focused attention and interest on the plight of the dwindling Orcas in the Seattle, Washington area. I’ll talk about that later. The most interesting article I read was in the Sunday New York Times on August 5, 2018. It was called “ An Orca, Her Dead Calf and Us” and was written by Susan Casey. Their core identity is communal, not individual. “Orcas are among Earth’s most socially sophisticated animals.” They live in matrilinear groups that can include four generations. The oldest females are in charge. Some can live to be 100 years old! 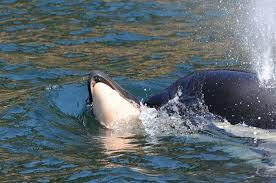 Fascinating fact – Orcas are one of just a few species, like humans, who go through menopause! This is because the grandmas are needed to devote themselves to training the younger generations. “The matriarchs serve as midwives, babysitters, navigators, and teachers.” Calves deprived of the care and influence of their grandmothers are ill-equipped for adult Orca life. “Orca behavior and neuroanatomy point to a complex inner life.” Their brains are larger and in some ways more elaborate than ours, especially in areas devoted to social emotions and awareness. They have similar neurons to ours that relate to empathy, communication, intuition and social intelligence. 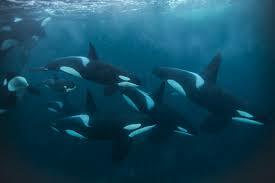 We have more in common with Orcas than we do with many other mammals. This makes it even more tragic that we are destroying the Orca’s habitats and putting the species at risk for extinction. There are only 75 Southern Orcas left in the Seattle habitat. There hasn’t been a successful birth there in three years. Many of the orcas have starved to death because their food supply is dwindling due to pollution and overfishing in the area. Biologists and government officials are now working on a plan to save the youngest member of Tahlequah’s pod, a three-year-old who seems to be on the brink of starvation. They are tracking the young whale and trying to feed her antibiotic laced salmon. They are also tracking Tahlequah because they are worried she may not be getting enough to eat, although members of her pod are bringing her food. It may not be enough because she is expending so much energy keeping her dead baby afloat. If we don’t reverse some of the environmental problems we have created for the Southern Orcas, our grandchildren will only read about these amazing creatures in history books. Knowing how much we share, emotionally, socially and linguistically, makes the prospect of their extinction particularly depressing. 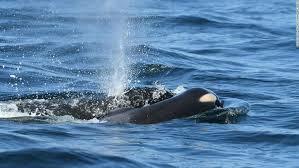 But the attention that is being focused on Tahlequah may actually help her pod’s survival. There are people who want to build a Trans Mountain Pipeline that would make the already dire situation of these Orcas much worse. Greenpeace, among other groups, is trying to stop this pipeline from being built. UPDATE – Aug. 13 – Tahlequah has finally let her calf go. 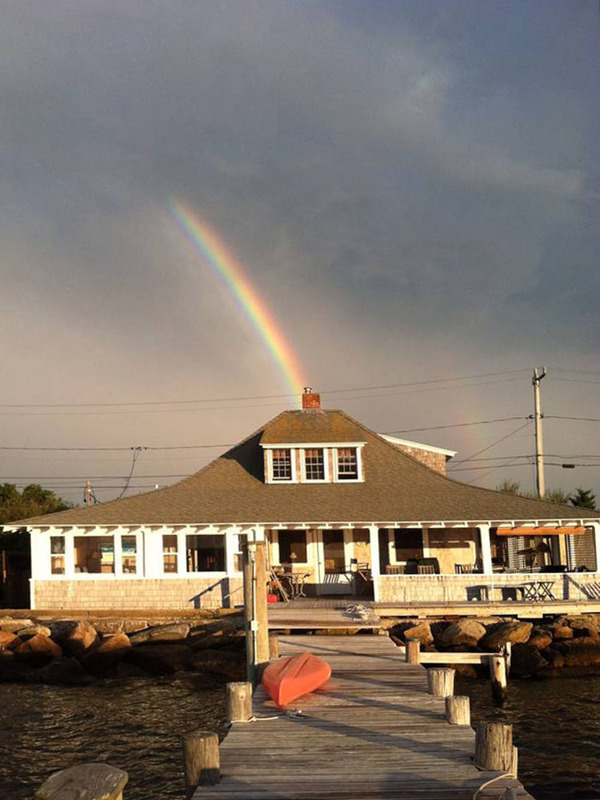 When we used to spend a month or more on the Vineyard and became “summer people,” our vacations were completely lacking in substance and that’s the way we liked them. You lost your watch on the third day. You forgot to wear underwear by the end of the first week. By the middle of the second week, you had no idea what day of the week it was and were probably at least a little tipsy. If you made it to week three, by then you forgot what you used to do back on the mainland. The Vineyard was where you went and nothing happened. There were no events. No parties. No concerts except usually one around the end of August to raise money for the food bank — generally the Taylor and Simon families propped up the event. Since 1884, islanders have enjoyed the beauty of this magnificent carousel. Built by Charles W.F. Dare, it is the nation’s oldest platform carousel still in operation. Acquired by the Preservation Trust in 1986, the carousel is a National Historic Landmark. Children (and others) may enjoy a ride from Easter Sunday through Columbus Day. Rides cost just $1 and if you catch the brass ring, you ride for free. Video games and refreshments are also available. Unless a president came to visit, or a plane crashed somewhere, nothing happened. Oh, right, one year, there were fireworks in the channel behind the house. There were two Clinton parties, one hosted by the Simons (that was when Clinton played the saxophone) and the next held by the Taylors, which is when I met Kate (I had no idea who she was until later). She was the only woman I met who dressed like me in long Indian dresses and beads. One year it was really hot. One summer it was surprisingly cold. One of our friends made an amazingly good daiquiri. I made frozen strawberry daiquiris using real strawberries and brown sugar that tasted so good, even people who never drank got wiped out. Back deck Vineyard house. Did a lot of drinking back there. Eating. And reading. There was a big rope hammock at the end of the deck. This picture had to be pre-restoration while we were still the summer residents — along with a bunch of other people. So what made it so special? Probably the same thing that makes boating special. Nothing. You slept, you hung out on the dock. Read a book. Roamed through Oak Bluffs looking for bargains. Wandered around Edgartown. Had a burger. Had a drink. Bought something useless but pretty. No substance. Doing nothing and loving it. 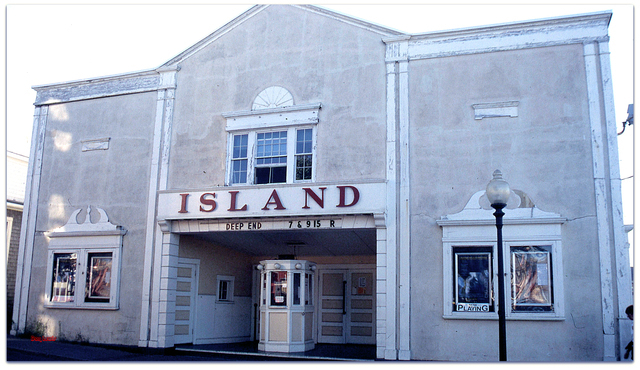 The Island Theatre. When we were there, it wasn’t air-conditioned. I suppose it is now. Strolled over to the Flying Horses carousel. If you got lucky, you might catch a gold ring and get a free ride while the calliope played. 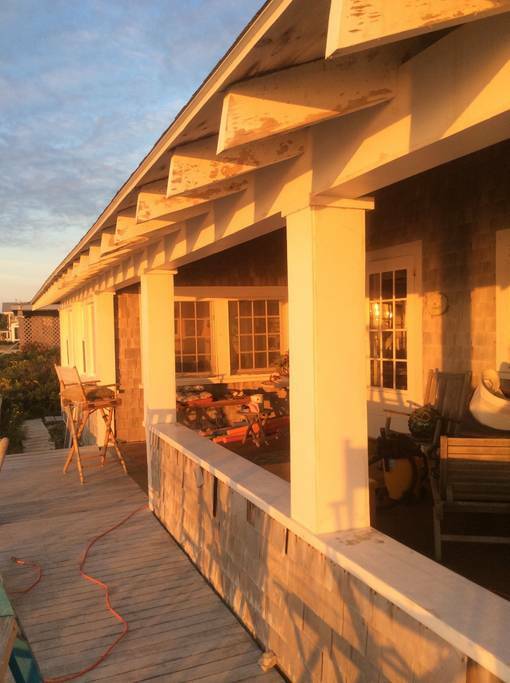 Watched pink sunsets over Nantucket Sound. If it rained, maybe we’d go to a movie. 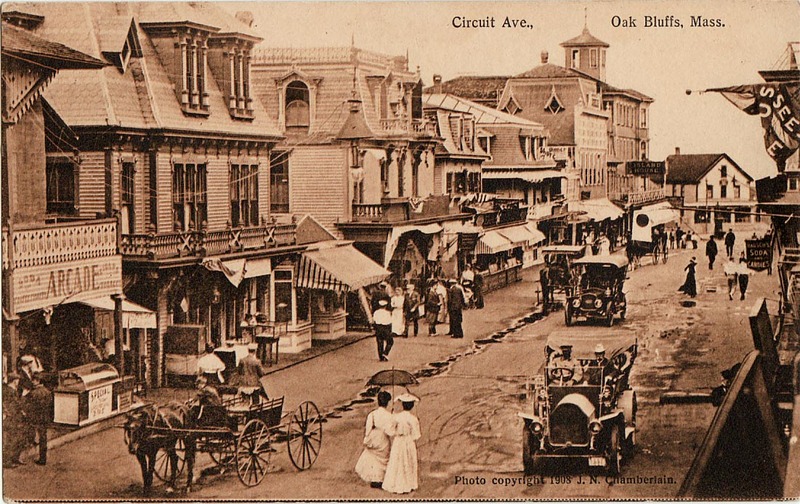 1891 – Circuit Avenue, Oak Bluffs. It changed very little in a century. There was no schedule until you had to leave. Then, you had to find your watch, make sure you could find your ferry tickets. Hope the bridge was not open so you wouldn’t miss your boat. Missing the boat could mean a very long day in the parking lot of the Steamship Company. Nothing was special or substantial about the Vineyard. That’s what made it special. Two years ago, I order 30 pairs of socks in all different colors and patterns. I realized, finally, that I was down to a bare two or three pairs and I wasn’t even sure they were real pairs, but they were at least more or less the same color. Around the same time, I also bought a lot of underwear on the theory that we wouldn’t have to do laundry nearly as often if I didn’t run out of underwear. Oh, and I refilled Garry’s sock and underwear collection too. Yesterday, Garry did laundry. My 30 pairs of socks have shrunk to about half a dozen pairs. I swear to you not only am I careful to keep pairs together, but Garry is passionate about matching them up. And keeping them clean. Which isn’t always easy because I wear them as slippers and have been known to go outside in socks … not always my best choice. Nonetheless, I realized no matter how much I didn’t want to face the crisis, I had to buy more socks. I found socks on Amazon — 12 pairs for $14.00 and they are all exactly the same. Because I know. We all know. Socks vanish. No matter how careful you are. 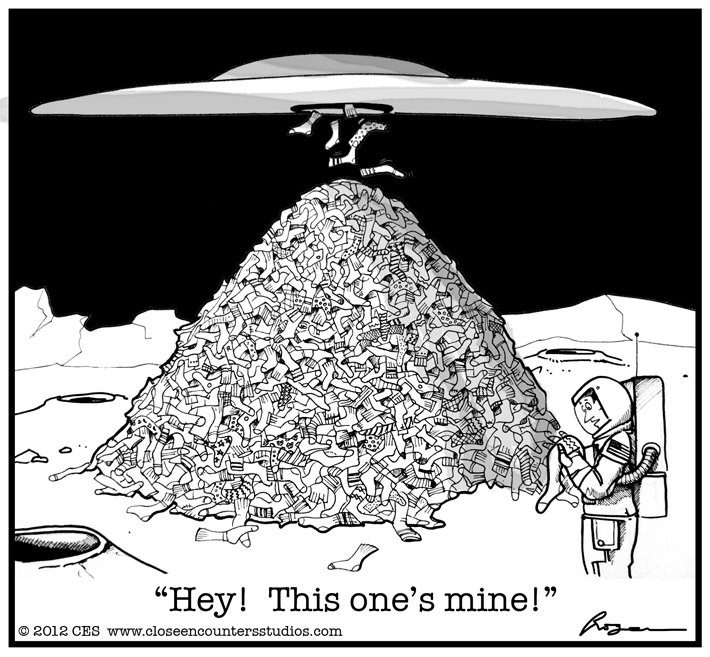 No matter how hard you try to keep track of them, over time, attrition will chew at the edges until you have no more than a few days worth of socks in your drawer. You will search that drawer. “Who took my socks?” you cry, but no answer will come to you. They are gone through the black hole in the universe (via your clothes dryer) into which all the single socks are eventually drawn. The mythical land or planet where a single sock can live forever. They are looking down on us and laughing. Because we persist in looking for them. Foolish humans. Garry, despite my assurances that there is nothing more he can do, that socks will go missing regardless, is sure I’m accusing him of sock-knapping. He does not yet understand. There is nothing anyone can do. There are greater forces at work here than mere humans can control. So this time, I’m ordering 12 identical pairs. As each sock disappears, I can wear it with another lonely sock. Variety is not the spice of life when discussing socks. 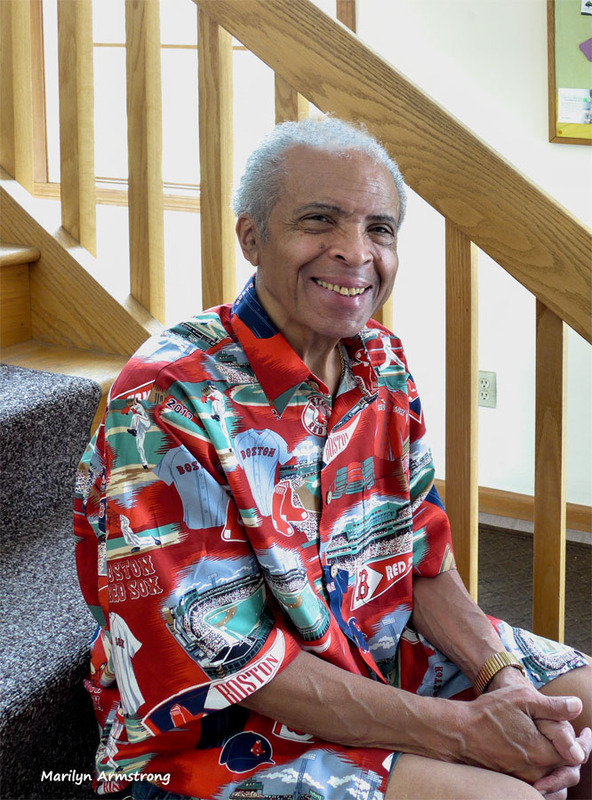 I want to start off — again — with the Garry cochlear implant update. He is doing better. He is less wobbly, can usually get up and down the stairs, but I’m glad we have a handrail. His ear is still sore. Not internally, but externally and I suspect it’s his addiction to wearing headphones for watching television that is preventing it from healing as fast as it otherwise would. In the end, he’s a big boy. He has to make his own decisions. I don’t think the irritation he’s causing is serious. There’s no sign of infection or oozing or any of the things that would normally alarm me, but it is definitely redder and more sore-looking than it was earlier in the week. It might be better if he left it to heal, but hey, it’s his ear. Overall, things are gradually getting more normal. Not “normal, normal,” but close to what I think normal might be — for us. Finally, we are close to his getting all that fancy techno-headgear that should enable him to really hear. Pretty exciting! Garry will get his own superpower. A class you wish you would have taken? I still wish I’d taken a few photography courses so I’d have a better grip on the terminology of photography. I know how to do most of the stuff, but I often have no idea what it’s called. 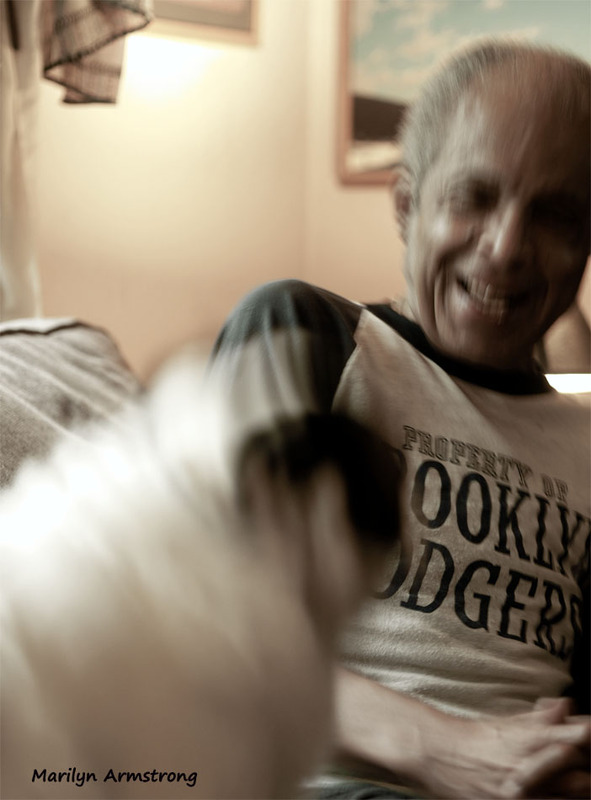 I took one course, a long time ago on wedding photography, but that was more than 50 years ago. 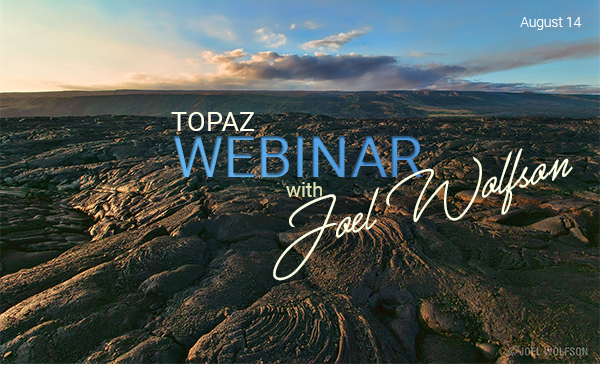 I decided to take a webinar given by Topaz this week on how to use the filters to make the pictures better, but more natural. There are a lot of free webinars online and I usually skip them because I’m at a point where “going to school” is on the bottom of my to-do list. But since I don’t have to travel and it’s free, why not? Maybe I’ll learn something useful! Can’t hurt, can it? Not as much as I was when I was younger. I get dizzy on the edge of a drop and I have what I think is a healthy fear of falling. That includes falling individually or falling in a car or on a horse or any old way. 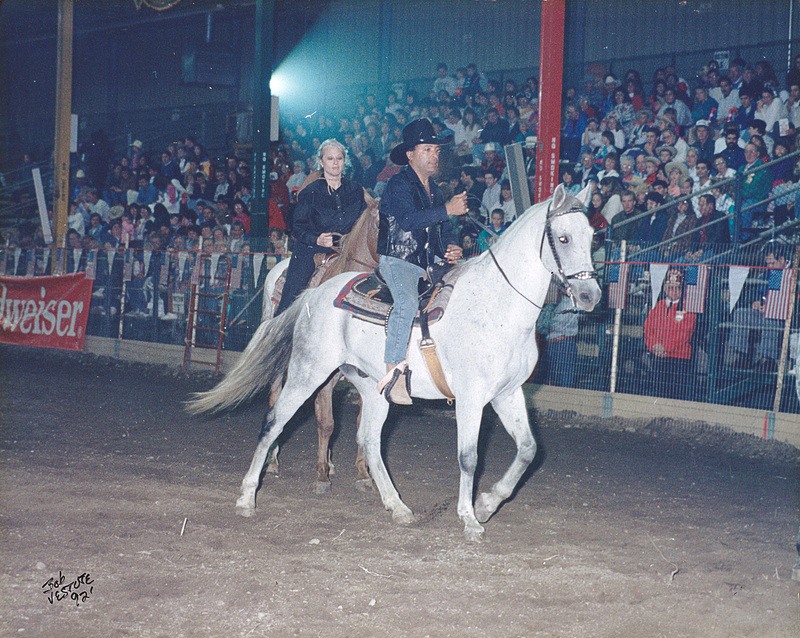 Falling off horses is what did my spine in the first time around. I hesitate to imagine what it would do to me now. Are you a good cook? If so, do you consider yourself a chef? Making sure the same recipe comes out the same way each time. I’m much more of a “what do I have in the fridge?” kind of cook. With a couple of exceptions, I doubt any two meals of mine have ever come out the same twice! I was very happy with the Manhattan chowder. I should have cooked the bacon longer, but otherwise, it was as good as any red chowder I’ve ever tasted.